It's extra-sensory heaven. Photo by Emily Fiffer. TORONTO – It's sticky-hot and my feet are swollen, but I don't care: I'm on a trolley on Queen Street West, heading out for cocktails in Toronto. This city is the kind where, upon landing, you feel an immediate sense of place. "I could move here," I think, as I cheekily banter with the flamboyant concierge at my hipster hotel, . For now, I enjoy my tourist status, unabashedly oohing and aahing at the slightest provocation. Our ride rumbles up the bustling street, passing hoards of artist-types, hopeful-looking teens, and goth crowds teeming outside of dark clubs. The culture is thick with youth and openness. Here, change feels possible. We arrive at the first stop on our nighttime tour: , a mixologist-driven haunt known for its attractive staff (confirmed) and molecular gastronomy-flecked cocktail list (confirmed — multiple times over). Go early, and you'll get face time with Frankie Solarik, the tall, affable owner. 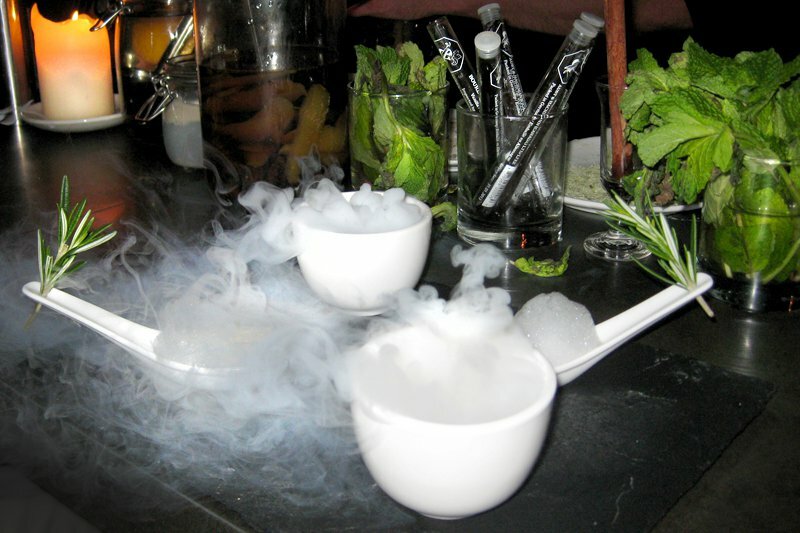 He aims to please, whetting our palettes with a summery starter that looks straight out of science lab: Dill mist from two liquid nitrogen-filled bowls cloaks two ceramic spoonfuls of gelatinous tonic and aquavit jelly. Rosemary springs, tucked cleverly into the spoon handles, waft the herb as you down the drink. It's extra-sensory heaven. Next up is another lablike concoction: Solarik's take on a tequila shot. Shot glasses are filled with reposado, capped with sage-hued foam, and rimmed with a mixture of coriander, tortilla, and salt. Two intricately plated spoons flank the drinks. Solarik explains the contents: avocado foam, tomato caviar, and the same salt mixture — a molecular chaser, if you will. We throw back the smooth liquid, wipe away our mousse moustaches, and eagerly lap up our spoonfuls. The tiny red globes pop between my teeth, and I laugh because I feel like I'm discovering something for the first time. Giddy from booze and good company, I order another drink. I'm a sucker for anything smoky, so the mezcal-esque's hickory-smoked syrup and a smoked Maldon rim taunt me. The drink is a bonfire in my mouth. Not too drunk to enjoy every last drop, nor too tipsy to call it a night (I've been looking forward to dinner at all week). And sober enough to commit it all to memory. Emily is a freelance writer and recipe tester/developer. She travels for the detours.